sisu: "The blogosphere is coming to an end"
"The blogosphere is coming to an end"
"What a great screenshot! :-)," emails "the other Sissy" of And What Next . 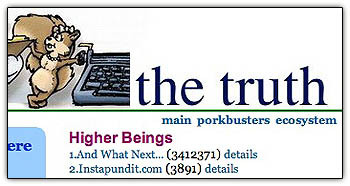 . . re The Truth Laid Bear's listing of her blog -- with an apparent 3,412,371 links -- as Number One in the blogosphere. "The blogosphere is coming to an end," writes "the other Sissy" -- proprietess of the delightful And What Next . . . -- astonished to find that her blog has suddenly skyrocketed into the stratosphere of the Ecosystem, with a leg up on the Master of the Blogosphere, InstaPundit himself. 'Don't know what TOS's usual Ecosystem ranking is but have noticed -- not without displeasure -- that our own position in the pecking order has sunken from a longtime mid-200's to the high 600's of late. The Bear moves in mysterious ways. Ach! I swear that ranking system is rank! I have NO idea how TLB firgures them.